Today was an eventful day in the wonderful world of wine, in oh so many ways. The backstory is important on this one--I had the stomach flu on Thursday night and Friday so that hampered my tasting ability for today. Nonetheless, we started out at a Bite of Oregon in Portland where I introduced my friend Burl from North Carolina to the bounty of Oregon food and drink. He did a bit of wine tasting, and found a little gem after tasting Hip Chicks do Wine, Airlee, and Eola Hills. Burl is a fan of big, dry reds so the Eola guy suggested that we stop by Zerba and test out their Malbec. Now, I didn't have it, but Burl gives it two thumbs up, and it won a gold medal in the "other" category at the Bite. Zerba is an Oregon winery in the Walla Walla valley--Milton Freewater to be exact. Now, I think this is sort of a cheating way of calling Washington wine as Oregon (not that there is a darn thing wrong with Washington wine). Anyway, Zerba is getting great reviews so keep an eye on it over the next few years. 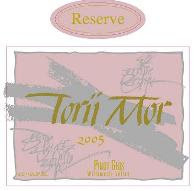 After Portland, we headed to Dundee to the Torii Mor winery, a small, super-premium winery that focuses on small lots of handcrafted, vineyard-designated Pinot noir in the Dundee Hills AVA. They have a wonderful tasting flight that includes 2 whites, 3 pinots, and 2 dessert wines for $10. While the Noir's were great, I walked away with a 2005 Reserve Pinot Gris. This gris comes from 4 vineyards, and is fruit-forward with flavors of apple, pear, lemon, and some herb spices. It was great upon tasting, and I'll do a more in-depth analysis when I crack open the bottle. On the way down the hill from the winery, I met one of Dundee's finest in a speed trap on 9th street. Beware, they don't cut any slack there and I have a hefty ticket to show for it. Next was a stop by the old standby, Willamette Valley Vineyards. Of note there today were the new release of the 2005 Tualitan Estate Pinot Noir and the 2005 Willamette Signature Cuvee Pinot Noir. They haven't had a signature cuvee since 2001, so expect good things from that one!